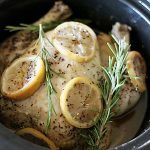 An easy slow cooker recipe for Lemon Garlic Chicken. Cut garlic heads and lemons in half and lay in bottom of slow cooker. Cut the bottoms off the lemons so they lay flat. Add a sprig of rosemary, or any herbs. Remove insides from chicken, rinse chicken and pat dry. Season chicken well, inside and out, with all-purpose steak seasoning or salt and pepper. Lay chicken on top of garlic and lemon slices and stuff the chicken with a garlic head cut in half, and a lemon cut in quarters. Cover top of chicken with additional lemon slices and rosemary. Turn slow cooker to high, and cook for about 4 hours, or until chicken reaches 165 degrees. Slow cooker cooking times vary. Important: Use a meat thermometer to check for doneness. When chicken has reached 165, turn off slow cooker and let chicken rest for about 15 minutes. Remove from slow cooker, carve and serve. Liquid from slow cooker can be strained and served over chicken.